After almost a year in the making, the winners of the The Patient Portraits: A New You Photography Competition have been announced. 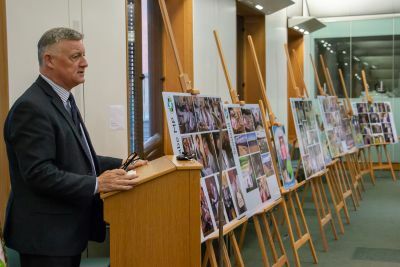 In an exhibition hosted by heart valve disease survivor and MP Steve McCabe at the Houses of Parliament the photos were revealed and the winners announced. Participating photographers, their model patients, clinicians and family members were on hand to peruse the photographic documentaries and celebrate the amazing work accomplished over this past year. The images depicted life from the valve disease patient’s perspective and showed how many patients with heart valve disease can go on to live full and high quality lives after treatment. The patients who were featured came from all walks of life, a range of ages and all enjoy a multitude of activities from cycling and swimming to teaching piano, gardening and chasing after their grandchildren. The selector panel made up of photography experts, a patient and a nurse who specialises in patient engagement had the difficult task of choosing our winners. In first place was Eric Etchart, who was paired with patient Alan Tancred. Eric was able to capture the precious moments in Alan’s life including his love of dancing and special moments with his lovely wife. Second place was given to Patrick Dixon who was paired with patient Brenda Walker and who’s photos displayed the wide range of activities that 84 year old Brenda is involved in. Third place was awarded to Lucy Jarvis, who worked with twins Christine and Katharine Greenland and was able to show the tranquility of the sisters’ quiet life in Norfolk. Awards for the Most Inspirational and Most Outstanding photo were also awarded and were presented to Lisa Casado for her portrait of patient Sue Jardine on the golf course and and Patrick Dixon for his photo of Brenda teaching a young English Literature student. Eric will receive a year long membership to competition partners The Royal Photographic Society. We would like to send a big thank you to all of the photographers who submitted photos at all of the phases of the competition and to all of the patients who generously donated their time to this competition. With some of the stunning photos were produced, we hope they will go a long way in helping to raise awareness of the importance of heart valve disease treatment and the full lives that patients can lead once they’ve been treated. View the finalist photos here.